Our goal is to provide quality medical and surgical treatment of the foot and ankle in a contemporary and compassionate way. Treatment protocols based on education, clinical experience and applying principles of evidence based medicine. Dr. Marcus is a Board Certified Foot and Ankle surgeon. He is also a Fellow of the American College of Foot Surgeons and a member of the American College of Podiatric Sports Medicine. He serves as a clinical advisor to the American Running and Fitness Association and was appointed to the Los Angeles Olympic Podiatry Staff during the 1984 Summer Games. He serves as a Qualified Medical Examiner in the state of California. 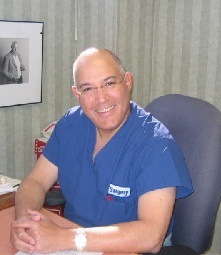 After completing his undergraduate studies at the University of Maryland, Dr. Marcus received his podiatric medical degree from the Temple University School of Podiatric Medicine, and completed his clinical training and residency at Cherry Hill Hospital in New Jersey, Lutheran Hospital of Maryland and Kern Hospital for Special Surgery in Michigan. Dr. Marcus has teaching appointments at the Temple University School of Podiatric Medicine and Western University College of Health Sciences. He has been involved in residency training for more than 20 years. He has lectured throughout the country on various topics relating to his specialty. Dr. Marcus has completed extensive post-graduate training in a number of specialized areas of reconstructive foot and ankle surgery. He has also authored a number of articles in professional publications. He is a member of both the Orange County and Los Angeles Podiatric Medical Association, the American Podiatric Medical Association and the American Diabetic Association. Dr. Marcus is currently in private practice in both Montebello and Irvine, California. He is on staff at Beverly Hospital in Montebello as well as Hoag Irvine, Hoag Orthopedic Institute and Hoag Newport. Dr..Marcus has extensive training in limb salvage in regard to the diabetic foot-having competed intensive training in the Ilizarov technique at the famed Russian Ilizarov Scientific Center for Restorative Traumatology and Orthopaedics in Kurgan, Russia. He has also attended a large majority of the American Academy of Orthopedics Surgery foot and ankle division meetings over the past 15 years. In October of 2013 attended the Sports Injury symposium in Houston, Texas. He treats patients ranging from 1 to 100 years old for various foot and ankle problems. 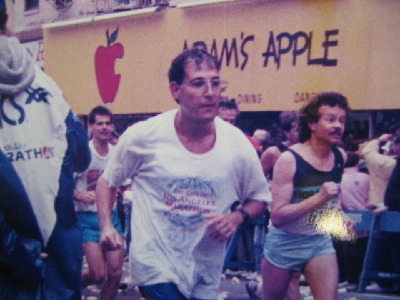 In addition to his professional accomplishments, Dr. Marcus has competed in twelve marathons, and qualified and completed the world-famous Boston Marathon in 1991.The picture of him running the NYC marathon is from 1990. He understands athletes both mentally and physically. He has been interviewed on various television stations and is recognized as an expert concerning injuries that runners experience. Athletes treated in his practice vary from your weekend warrior to Olympic contenders. Our trusted staff collectively has years of experience in medicine. Julie, Sori, Gloria, Carmen, Raymi, Maria and Jennifer are all energetic- dedicated assistants of mine that will insure that your experience will be second to none. They are knowledgable, respectful, sensitive and committed to insuring that your visit will be pleasant and productive. The surgical staffs at our hospitals are also oriented to my specialty in such a way as to provide the most contemporary methods in foot and ankle surgery.